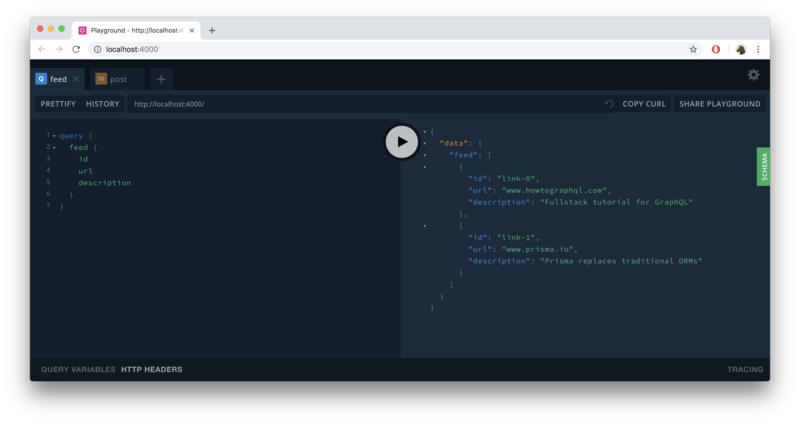 In this section, you’ll learn how to add a mutation to the GraphQL API. This mutation will allow you to post new links to the server. Like before, you need to start by adding the new operation to your GraphQL schema definition. At this point, the schema definition already has grown to be quite large. Let’s refactor the app a bit and pull the schema out into its own file! With that new file in place, you can cleanup index.js a bit. One convenient thing about the constructor of the GraphQLServer is that typeDefs can be provided either directly as a string (as you previously did) or by referencing a file that contains your schema definition (this is what you’re doing now). The next step in the process of adding a new feature to the API is to implement the resolver function for the new field. First off, note that you’re entirely removing the Link resolvers (as explained before). They are not needed because the GraphQL server infers what they look like. You’re adding a new integer variable that simply serves as a way to generate unique IDs for newly created Link elements. The implementation of the post resolver first creates a new link object, then adds it to the existing links list and finally returns the new link. Now it’s a good time to discuss the second argument that’s passed into all resolver functions: args. Any guesses what it’s used for? Correct! It carries the arguments for the operation - in this case the url and description of the Link to be created. We didn’t need it for the feed and info resolvers before, because the corresponding root fields don’t specify any arguments in the schema definition. description: "Prisma replaces traditional ORMs"
However, once you kill and restart the server, you’ll notice that the previously added links are now gone and you need to add them again. This is because the links are only stored in-memory, in the links array. In the next sections, you will learn how to add a database layer to the GraphQL server in order to persists the data beyond the runtime of the server. What is the second argument that's passed into GraphQL resolvers used for?